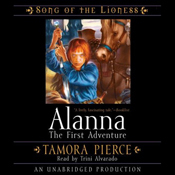 Alanna: The First Adventure by Tamora Pierce, read by Trini Alvarado. (Grades 5 and up.) Listening Library, 2003. 5 hours and 17 minutes. Reviewed from copy "purchased" through Audible during a special promotion. I first read this series when I was in grad school. I wasn't expecting to like them much, but they were popular books and I felt like I should at least give the first one a try. I was totally surprised by how AWESOME they are. Alanna's just the kind of character that you love to root for. She's got a good heart and she's feisty and she shakes things up. Plus, she's an awesome fighter and a powerful female. I forget who recommended the audiobooks to me (was it you, Erin? ), but I am so glad they did! Funny story, though. My local public library does not own them. At one point they had Alanna on CD, but it must have been damaged or lost because I had it on hold forever and it never came in. So when Audible was running a promotion where you got 2 free downloads for starting a trial membership, I jumped on it and downloaded the first two audiobooks in the Song of the Lioness series. I love them! Trini Alvarado (you may know her as Meg in 1994's movie version of Little Women) reads and she does a wonderful job. It's partially voiced, nothing too incredibly flashy, but she's just a good reader with a nice voice. I felt like I was sitting with a friend telling me a story and that made me want to keep coming back to the audiobook. In fact, I actually looked forward to my commute because I'd get a little more listening time in. This is a wonderful story, well told and well read. If you haven't read Tamora Pierce's Song of the Lioness series, I can happily recommend the audiobooks to you! They're on shelves now! Hey! I'm an Audible affiliate, so if you purchase an audiobook after clicking on one of my affiliate links, I may receive a referral fee.